After the announcement that Call of Duty esports would be going 5v5 a lot of rosters had to make changes. That includes the Call of Duty powerhouse team “OpTic Gaming”. After a disappointing World War 2 season, OpTic Gaming looked to bounce back. During the World War 2 season OpTic struggled with players not being “committed enough”, “not liking the game”, and the failure to bring home a tournament win – something they have done over the previous 4 Call of Duty titles. 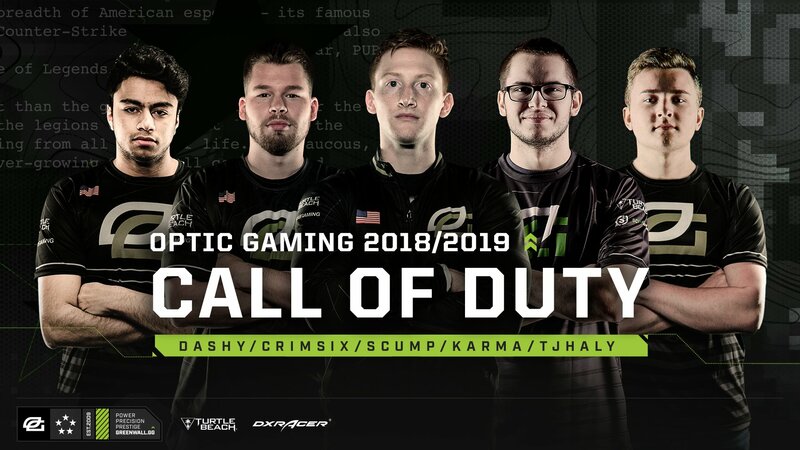 OpTic has announced their new Call of Duty roster via Vision (an esports documentary produced by OpTic Gaming). There have been plenty of rumors, and leaked rosters all over Reddit which have stated Teej and Dashy would be joining OpTic. However, nobody knew who they 5th player would be. Some argued that it would be Karma, while others believed he would never returned to OpTic Gaming after they decided to bench him during the World War 2 season. Damon rejoins the team after stating himself that he “doesn’t like” World War 2 and had a lack of passion to play the game. Karma has always been one of the top tier players when it comes to Treyarch games – so it makes complete sense they would add him to the active roster. TJ Haly joins from Rise Nation where he won his first competitive championships. TJ helped Rise secure victories at CWL Anaheim and CWL Seattle. TJ runs a submachine gun and will join Scump on the front lines. Dashy joins OpTic Gaming from compLexity. Dashy is yet to win his first major championship but did perform well over the World War 2 season. Dashy is mostly an AR player, and will try and fill the void left by a Formal & Octane exit. Both players hope to improve OpTic Gaming’s search and destroy game, a game mode they have notoriously struggled in over the past couple titles.